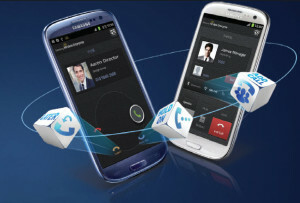 WE Voip | Business Phone Systems Albany NY | Samsung Phone Systems Albany | Allied Telcom | Allied Business Systems	| Allied Business Communications, Inc.
Samsung WE VoIP is a smartphone application that provides corporate users voice-over-IP communications over private Wi-Fi networks when in the office and public Wi-Fi or 4G/LTE network when out of the office. It is equipped with High Definition (HD) voice technology, 3g dialer and full-featured phone functionality to bring professionals a convenient, easy-to-use, and crystal clear voice experience. Through the Samsung Communication Manager (SCM) or Samsung OfficeServ 7000 Series phone systems, this application turns your mobile device into a full-featured Samsung IP phone, providing conference calling, transferring, call back later, and hold functions over your corporate Wi-Fi network.